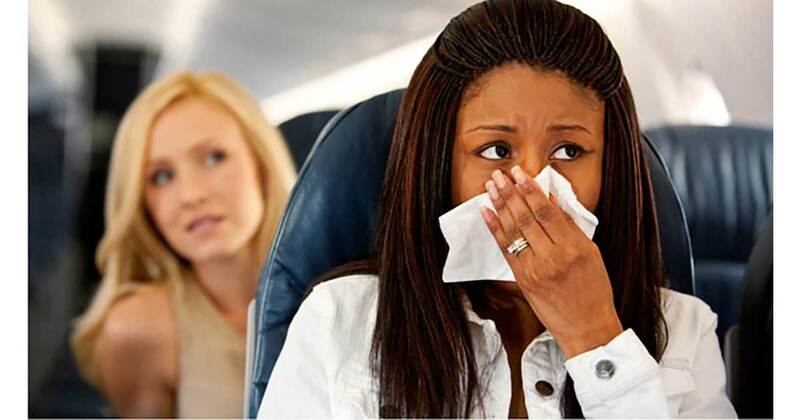 Apart from a fear of heights, one of the more common worries involves catching a cold during a flight. This is a reasonable concern. The higher chances of catching a cold are mostly due to environmental factors, which have been shown to increase the chances of getting a cold by up to 20%. Also, the concentration of various electromagnetic fields drawn from passengers’ cell phones and laptops affect the body’s immune system. Before the plane takes off, thoroughly wash your hands with water and soap. Better yet, use an alcohol-based hand sanitizer without forgetting the back of your hand and under your nails. During the flight, wash your hands often. When traveling, hand-washing should not be limited to the ‘before eating’ and ‘after the toilet’ routine. Get good rest on the day before you board the plane. After the flight, ensure that you get a good night’s sleep too. Fatigue weakens the body’s immune system and thus every germ that comes your way is likely to get into your system. Studies have shown that staying in a confined space with shared air and low cabin humidity will only work to exacerbate your cold. If you are suffering from other illnesses, consult with your doctor before choosing to fly. This goes back to weeks before your trip. Avoid sugary foods because they inhibit the performance of the body’s immune system. Consequently, the body becomes more vulnerable to infections such as the flu virus. Also, avoid junk food and any type of processed foods during the flight. Such foods weaken the immune system. Sitting in the aisle seats increases the chances of coming into contact with sick passengers. Instead, pick a window seat because there is less human traffic. This way, you are less likely to get your armrest or headrest touched by potentially infectious passengers. A flight may take several hours, and the last thing you want is to stay dehydrated for that long. The airplane cabins are notorious for being unusually dry. It is advisable to take sips throughout the flight as opposed to drinking large quantities at once. A dehydrated body is a sure way to catch a cold because the body does not have the means to flush out the germs. Moreover, proper hydration will help your body perform the essential functions of transporting nutrients and body temperature regulation. These drinks decrease your body’s hydration level. The air on the plane is dryer than the air on the ground. Combine this and the dehydrating effect of alcohol or caffeine, and you are highly likely to catch a cold. Also, keep yourself safe by breathing out and washing your hands frequently during the flight. Depending on the airplane you are on, you may be allowed to wear a nasal mask or screen. The masks protect you by filtering the air within the plane.